My trekking experience with Salkantay.org was one I will never forget. 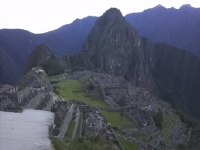 I was going to book the famous Inca Trail when I realized that it requires booking months in advance. Fortunately, I found another trek to Machu Picchu--the Salkantay trek. I came across Salkantay.org and began the process. Booking was easy, and questions were promptly answered. Once the trek was booked and flights to Cusco we're arranged, we were on the way to an experience of a lifetime, we made the city tour and the sacred valley, these tours were beautiful we had opportunity to know more about Cusco and Inca culture. The trail provided a challenging and beautiful path to Machu Picchu, which should not be missed. However, Machu Picchu was just one of the amazing views. The trail leads you through all climates to breathtaking vistas along the way. Our guide was knowledgeable and funny, and clearly had the group's best interests in mind. We were all constantly surprised by the quality of the food provided by the cooks, it was delicious we tried different dishes of Peruvian food, and the supplied camping equipment was in good condition. I cannot wait to share this experience with my friends and family and hope to hit the trail again soon.